I recently saw this See by Chloe top at Saks.Com and fell in love with it. 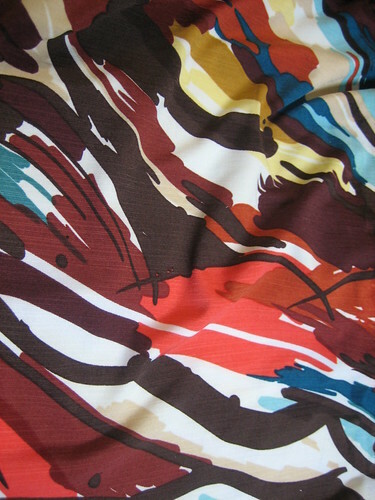 I searched The Stash and sadly didn’t have any silk print with the same type of design but I did find a beautiful jersey that I bought from Gorgeous Fabrics recently (sadly, it’s sold out)! I actually like the pattern a little more than the designer original because it’s not as voluminous – important when you are only 5’3″ tall! 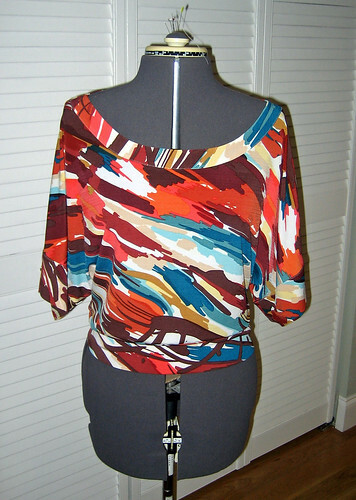 To give it the same feeling as the See blouse I decided to add an exposed facing and sleeve bands. This takes a little more time but is well worth the effort. Notice that I used a round neck instead of a square one – just my personal preference. It’s just as easy to make a square neck if you prefer. I also lowered the neckline 1″ because it was a little high on me. 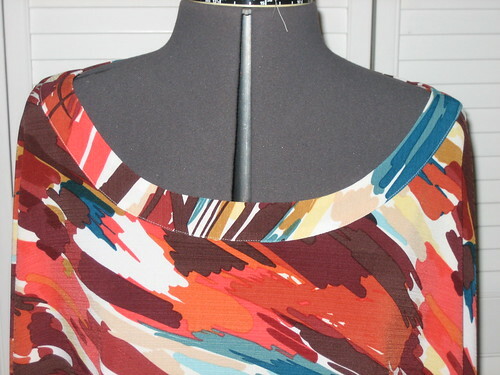 Next time I will definitely narrow the neckline at the shoulders – it is a lot wider than it appears. I’ll be needing some lingerie guards! That is the only alteration I made to the pattern. I cut my usual size 8 but, depending on the fabric, I could go down to a 6 next time. It’s cut very generously so no FBA was needed. Before I show the facing I want to mention that I sewed the shoulder/sleeve seam conventionally and pressed the seam open. 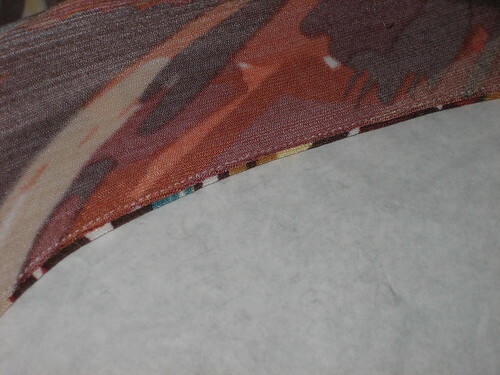 I find that this type of seam often draws up and doesn’t hang nicely when sewn on the serger. You can see that my seam has retained it’s drape. 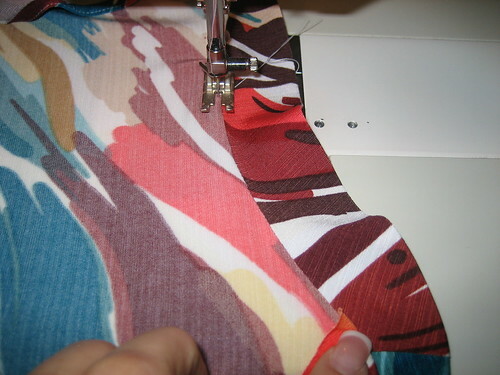 To draft your facing it’s a good idea to first trim down your neckline seam allowance to 1/4″. I always use 1/4″ on all enclosed seams. 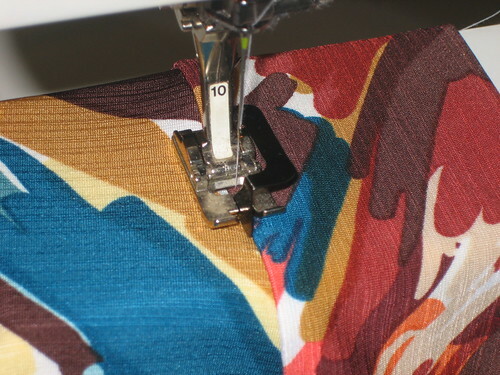 It’s easier to sew accurately and saves the extra step of trimming later. 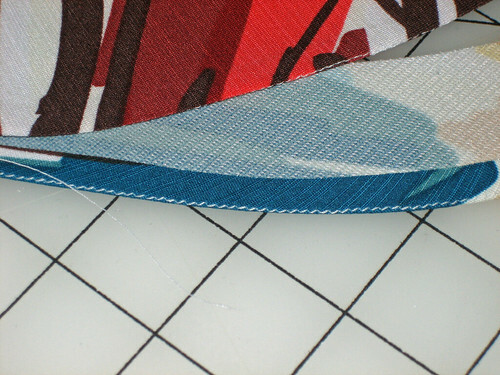 Next, using a small ruler or gauge, mark your facing line directly onto the pattern. I made mine 1.75″ wide for a finished width of 1.25″. You can make yours as wide or as narrow as you like. 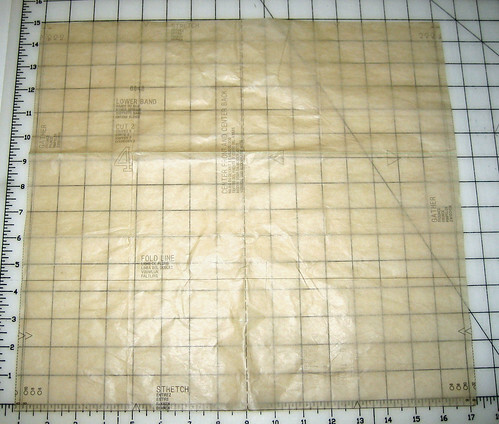 Then simply trace this off to make your facing pattern pieces. 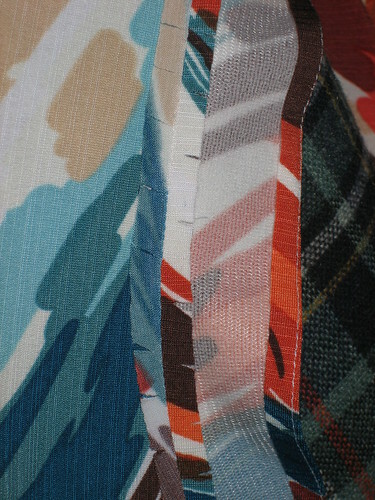 I then block fused my fabric and cut out my facings. Notice that I cut the facings on the opposite grain so that they would show up better. If you are going to do the work it’s nice for it to show! 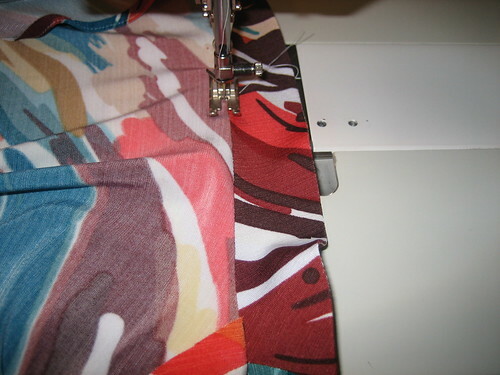 Now for the tedious part: After you sew the facing shoulder seams, you’ll need to turn in 1/4″ on the outside edge. 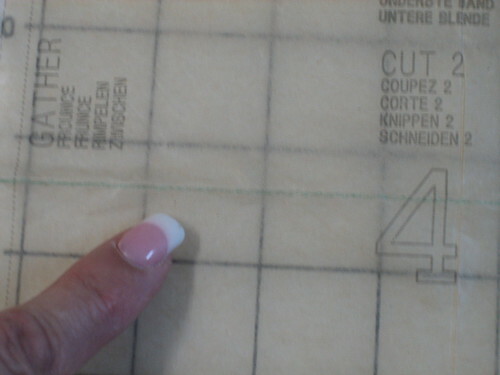 To make this easy and accurate I sewed 1/4″ from the edge and then used the stitching as a guide to turn the edge in. As you can see, I turned the edge in just past the stitching so that I wouldn’t have to remove any of it later. Then it’s time to attach the facing right side to the garment wrong side and stitch. Next, clip your seam and press it open. Notice that I alternate clips on the garment and facing. I think this makes for a much nicer finish especially in heavier fabrics because you won’t get those little indentations from the clips showing through. then topstitch the facing in place. Some sort of topstitching or edge foot is really helpful here. The sleeve bands were merely sewn into a circle, folded in half and serged on in the round. Then I edgestitched the seam to give the appearance of a binding. Easy! My bands are 2.75″ wide. I cut them 6″ wide to start. I wanted them a little wider but that’s all the fabric I had left after a stupid cutting error. 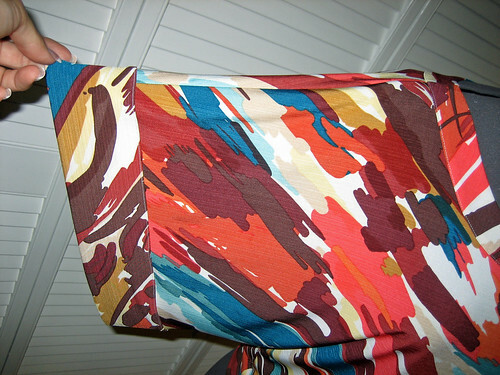 Since I liked the original length of the sleeves I trimmed the garment sleeves 2.5″ so that I would retain that length (2.75″ band width minus 1/4″ seam allowance). Because there is so much volume on the top I wanted the fit around my waist and hip to be as trim as possible so I needed to eliminate the ruching on the band. This is a super-easy fix here as only the outer band is ruched, the inner band is flat. 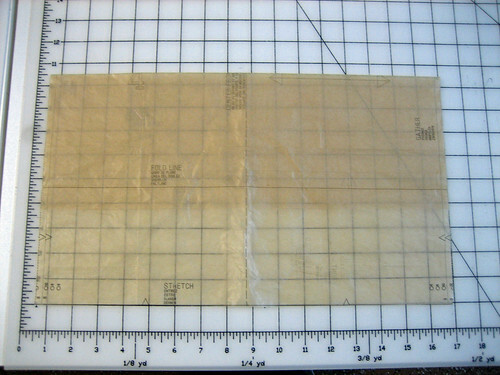 Simply measure the width of the inner band from the cut edge to the foldline marked on the pattern. Then draw a new line at the same width on the ruched section and fold (or cut) away the unwanted tissue. Super top. Great way of finishing. I must try that soon. Really cute. Do we get to see it on you? Thank you! You probably won’t get to see it on me since I live alone and am terrible at mirror pics. Thanks so much – there are so many great tips there for making simple garments look professional. And it looks great! So pretty! Thank you for sharing – you make it appear so easy. 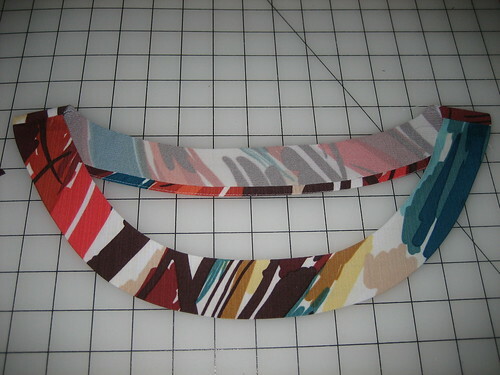 I love it Gigi, this and the post you did on the neckband have really inspired me in my working with knits! Love this. I am going to have to do this soon. Great idea! Simple, actually….I think many of us are so molded into thinking things have to be sewn “right sides together” that we miss opportunities like this! Thanks for inspiring me! I think we have definitively entered the Gigi Era for knits! This top looks better than the “See” example, especially the fabric choice and facing contrast which does make it show up nicely. 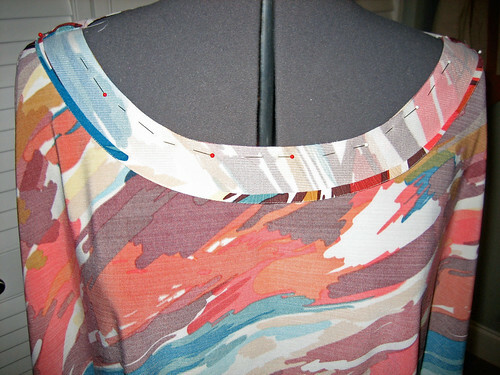 Your tutorial on drafting a facing from scratch is great–perfect for those patterns that ask for bias trimmed edges and that’s not what’s wanted. also: Your suggestion to ‘block fuse’ should be a law. It’s the only way to get those little pieces neatly fused, but you won’t find it mentioned in pattern directions. The exposed facing is very cool! Thanks for showing us how it’s done. Wow! Great job. Miss Janey likes this fabric better than the one from Saks. Great top! 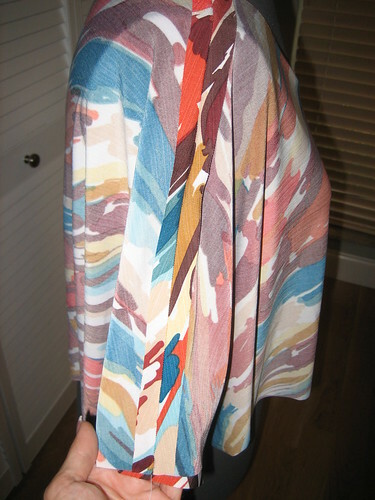 I picked up this pattern last week, to sew this weekend – thanks for the timely review and advice. I’ve been pouring over your wonderful garments, I aspire to your level of sewing, I hope that patience and practice will get me there. Could you please help me understand how to narrow up the shoulders so I won’t expose my bra straps? Would I need to add to my shoulder/neck area and taper out to the original neckline? If so, do you think an inch would do it? Any advice would be greatly appreciated. I love stopping by to see your newest creation. LOVE it! Reminds me of tops my sister wore in the day. She was so stylish. Why do you press the seam open if you are then understitching both seam allowances to the body of the garment? I would have thought it would make the facing seam allowance behave badly and not allow itself to be understitched in place properly. Jules, I always press them open so that I have a nice flat seam. Then you can press them towards the facing if it’ll make understitching easier. It just makes for a crisper edge IMO. I love this top! It truly turned out very nice! I LOVE LOVE LOOOOOOVE this shirt!! The neck is so obviously huge, I don’t believe this shirt could be worn without fixing it, especially by a ready to wear size 4. I wonder if this is because you lowered it an inch, or because of the addition of the facing, or if there is something wrong with the pattern. After seeing the finished product, I’m a little nervous about making this shirt although I purchased the pattern. There’s definitely something wrong here.